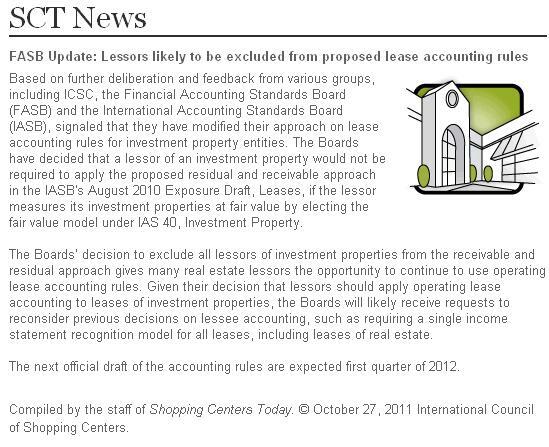 FASB Lease Accounting Update: Will Lessors/Landlords be excluded? Much has been written about the significant joint undertaking by FASB and IFRS to update lease accounting rules in the name of improved transparency. With real estate leases comprising a high percentage of all operating leases, the potential impact for the commercial real estate industry looms large, for landlords, tenants, brokers and property managers alike. After taking significant public comment on its exposure draft published in August 2010, FASB agreed to reconsider its proposed guidance. The primary aspect of the draft changes redefined all operating leases as right-of-use assets (capital leases), thereby moving accounting from the operating statement to the balance sheet. The volume and nature of comments has pushed final guidance back to 2012. However, in a recent Project Update published on FASB's website, FASB indicated that the two bodies have "tentatively decided that a lessor’s lease of investment property would not be within the scope of the receivable and residual approach. Instead, for such leases the lessor should continue to recognize the underlying asset and recognize lease income over the lease term." Ken Ashley, Cushman & Wakefield Atlanta - Can we be transparent here? The boards unanimously agreed to open the revised lease standard proposals for interested parties to comment. Expect continued input from commercial real estate industry advocates, including ICSC, BOMA, and key real estate interests and consider commenting personally if the proposed standards impact your business. While at PICOR, we are neither accountants, nor do we play ones on TV, we are continuing to monitor this rulemaking to prepare our Tucson clients, both lessors and lessees, for compliance as guidelines unfold. That being said, if you have technical understanding to contribute to the conversation, we welcome your comments below. Barbi Reuter, RPA oversees PICOR’s operations, research, finance and new media activities, liaises with the global services platform provided through the Cushman & Wakefield Alliance, and serves as Associate Broker. One of 13 company Principals, she is active in industry and community leadership, through such organizations as Commercial Real Estate Women (CREW), Greater Tucson Leadership, Arizona Town Hall, and board work for the Tucson Girls Chorus and PICOR Charitable Foundation.